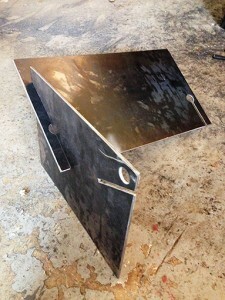 Tecton, a knock down pit for camping or everyday use! is still the same 5mm thick quality fire pit as the others but Tecton is able to travel flat in the back of your car on your camping trips. 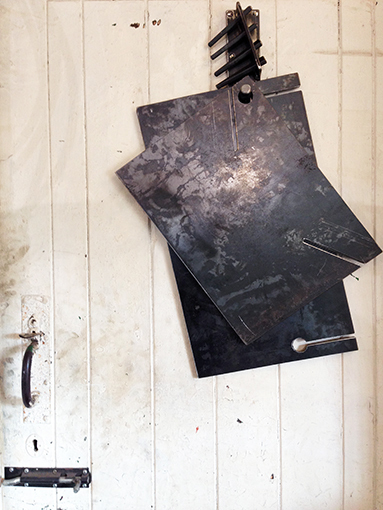 When your home you can hang it up in the shed ready for next time. 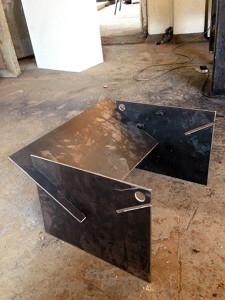 Its easy to assemble, it slots together and becomes sturdy when the pegs are inserted in the holes. 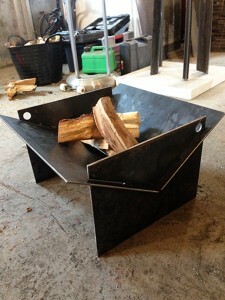 The whole fire pit and securing pegs can then be stored away on the holder like sheets of leather! 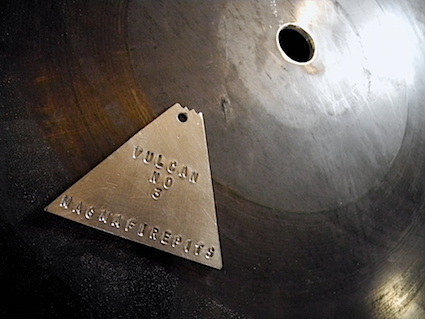 Each Vulcan fire pit comes with its own Vulcan provenance tag. The badge is sitting on the upturned pit here as it looks like some kind of space pic! We hand make and stamp the tags with individual numbers. 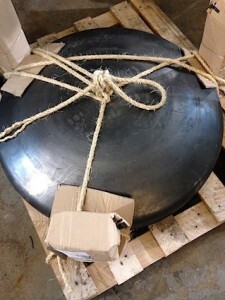 We attach them to the pits with stainless steel welding wire. Additionally click here for custom metalwork. We wrap our pits for delivery as ecologically as possible, using biodegradable sizal rope, used cardboard and a used pallet! So with with Eco wrapping! You cant go wrong! I hate seeing all that plastic swathed over goods as it just goes into landfill! Why not use the cardboard and broken up pallet to get your first fire going! Furthermore purchasing a tree from the woodland trust will soak up some of that carbon!